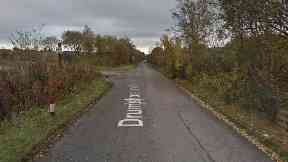 The attacker tried to steal the victim's vehicle during the incident in West Lothian. A bare-chested man stopped a car by standing in the middle of a road before attacking its driver and trying to steal his car. Police are hunting the suspect responsible for the incident in West Lothian on Monday, May 14. The man was seen holding a metal object on Drumshoreland Road in Pumpherston, near a refuse site. After stopping his Ford Focus the 38-year-old driver was attacked and hit in the face. However, he was able to drive away despite the attacker's attempts to steal his car. Police are now trying to trace the man responsible. Detective sergeant David Macmillan from Livingston CID said: "This is a very unusual incident, which resulted in the victims sustaining some painful injuries to his face. "Though, thankfully, he did not surrender the keys to his vehicle and was able to get away from his attacker. "Anyone who was on Drumshoreland Road on Monday evening and saw anything suspicious is urged to contact police immediately. "We also have a very good description of the suspect and would ask that anyone who recognises the description of this man also gets in touch." Anyone with information has been asked to contact Livingston CID via 101.